My Halloween projects are on the Sept 12 post (see archives). 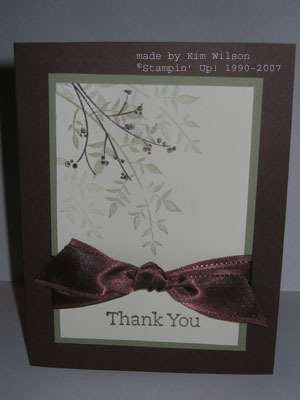 Here’s a nice card for a fall thank you or even for Christmas. Ribbon – the gorgeous satin from the holiday mini – a must have! SO pretty. Very elegant. I love the satin ribbon. I think I may have to stock up since it will only be available through Nov 30. I hate to see it go. Love this card, so simple and elegant. Love your site too. Nice projects.